If it's cold, rainy, or snowy where you are right now, here's a breath of springtime from the 2011 Houston International Quilt Festival. Join us for a look at some great floral-themed quilts ! Tina says, "I wanted to make a garden quilt. I like the mix of the styles of the flowers in this composition-with some more realistic, some quite cartoonish, and the rest somewhere in between. I also looked for a mix of colors ( as in my favorite real gardens) and a variety of sizes of flowers to add to the visual interest. Yellow fabrics between wedges of light blue fabrics suggest the rays of the sun. For the stems, I used a mix of mid-to-dark green fabrics, including stripes, checks, and paisleys. " With its highly effective use of complementary and split-complementary hues, this was one of the happiest quilts we saw at the Houston Festival. Here's a lovely eye-catching original design of welcoming icy blue, lavender, and white flowers against a sapphire blue patchwork background. Ann used commercial and hand-dyed fabrics, along with hand-painted fabrics for the flowers. She notes, "The flowers and leaves are machine appliqued using a stitch that I have developed called tri-step applique. It is based on free-motion embroidery and creates an extremely wide and soft subtle stitch that covers the edge on each oversized shape. Machine quilting this piece was a joy." Liz Jones, author of the Flowers, Hearts, and Garlands Quilt book, has created a fabulous applique of a garden bursting with flowers and trees loaded with fruit. Two enchanted castles peek out of the background. Her quilt is an original design, done with cotton batik fabrics and cotton threads. Liz writes, "This design is inspired by the medieval "Devonshire Tapestries" in the Victoria and Albert Museum of London." 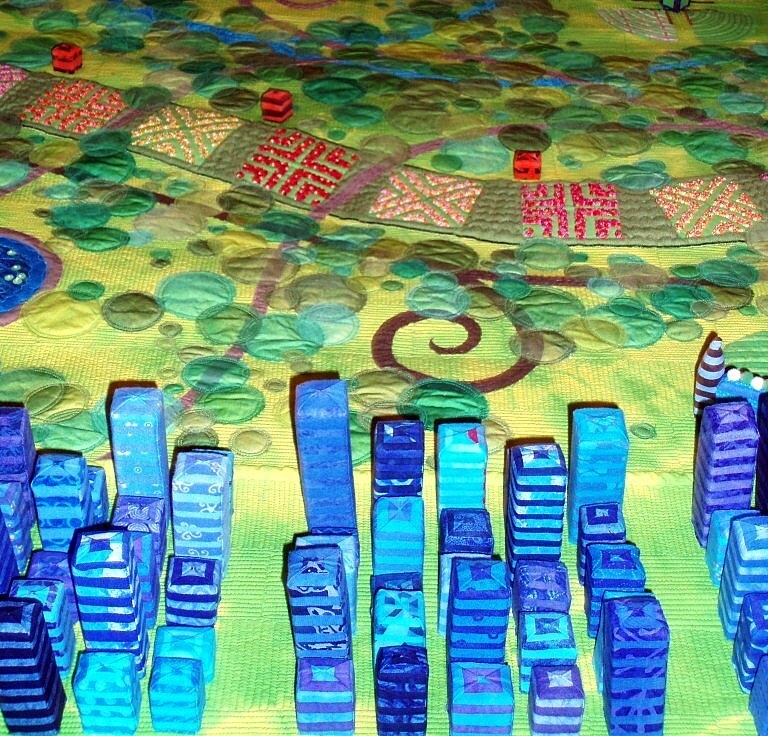 We love the intricate and careful detail that went into this delightful and almost magical scene. Two gorgeous lilies, serve as the focal point of this magnificent machine appliqued and quilted artwork, inspired by the flowers in Naoko's garden. The centers of each flower petal are decorated with stunning gold metallic fabric, which really makes the lilies pop right off the bright red background. The quilter writes in her description, "Philipp Franz von Siebold was very impressed with the Japanese lily and brought bulbs back to his country, Holland. The climate in Holland wouldn't allow the Japanese lily to grow. It became a popular flower, and everyone hoped to have them. I like the Japanese lily very much. I accomplished his dream by showing the Japanese lily in bloom on my quilt using Japanese vintage kimono and obi fabrics. " 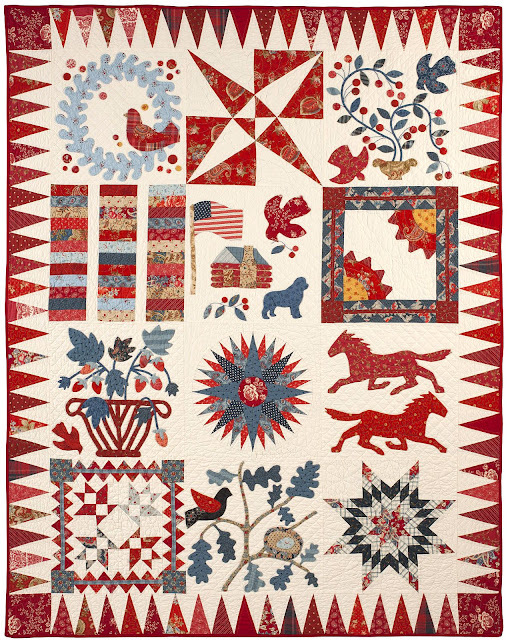 This vibrant, dynamically colored machine-appliqued quilt made with cotton fabrics and varied threads, will blast you right out of the winter doldrums. Elizabeth says, "Inspired by painter Georgia O' Keefe, I used French Fuse techniques to construct this wall hanging using the "Poppy" pattern﻿ by Carol Morissey . 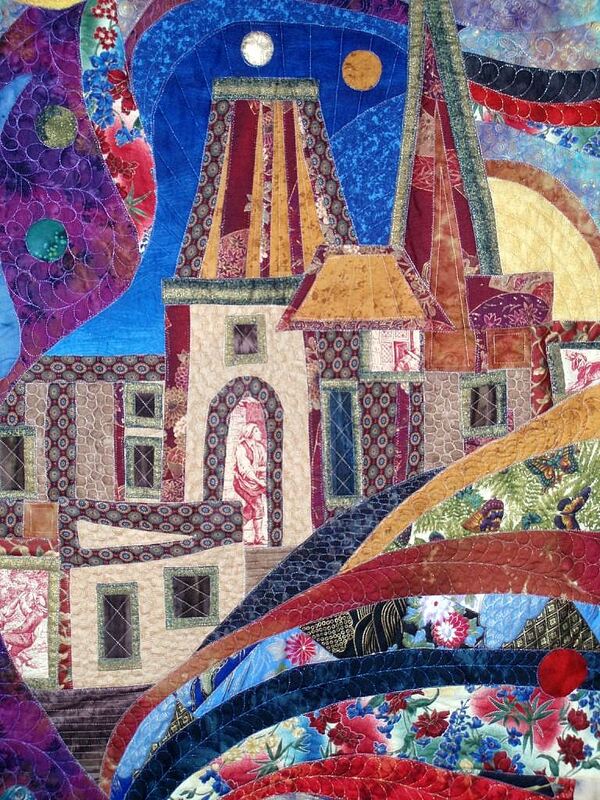 The appeal of colorful, large scale designs and challenging applique has led me into the world of art quilts. I love it more every day !" Did you know that St. Patrick's Day is the most widely celebrated saint's day in the world? 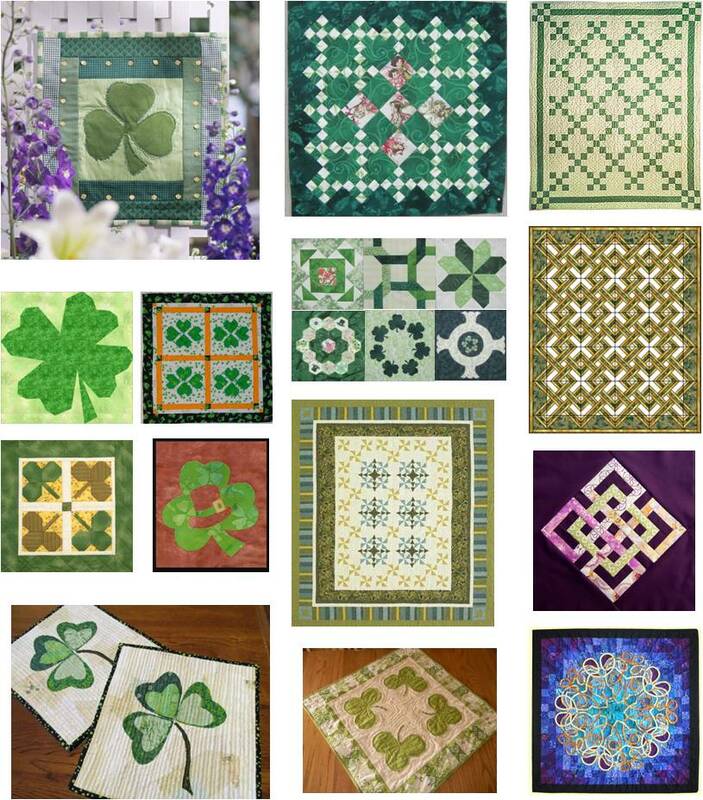 For free patterns for shamrocks, Irish chain quilts, celtic knots and more, see our updated Free Pattern Day post. 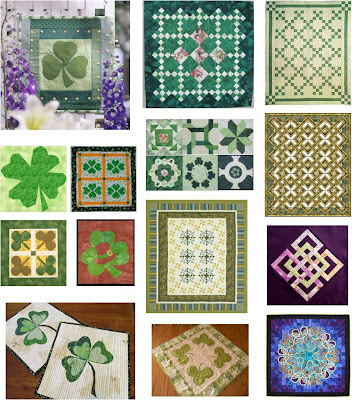 We're always excited when we come across a quilter who makes us think about traditional designs in an entirely new way. 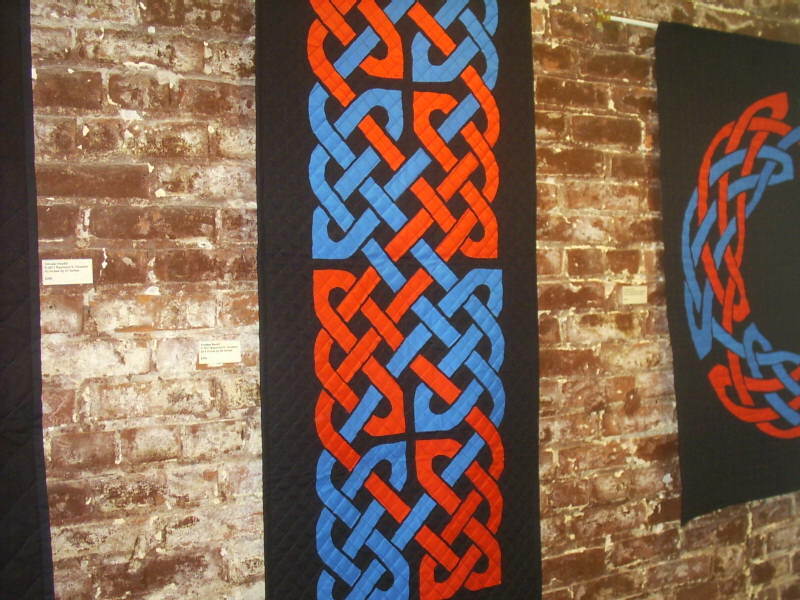 Thus you can imagine our delight when we saw the modern Celtic Knots of textile artist Raymond K. Houston. 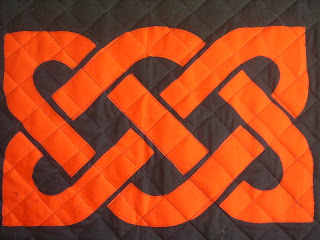 In his artist's statement he explains: "Celtic knots fascinate me. Celtic knots are endless loops: they twist and turn; they weave over and under; and they end up where they began. 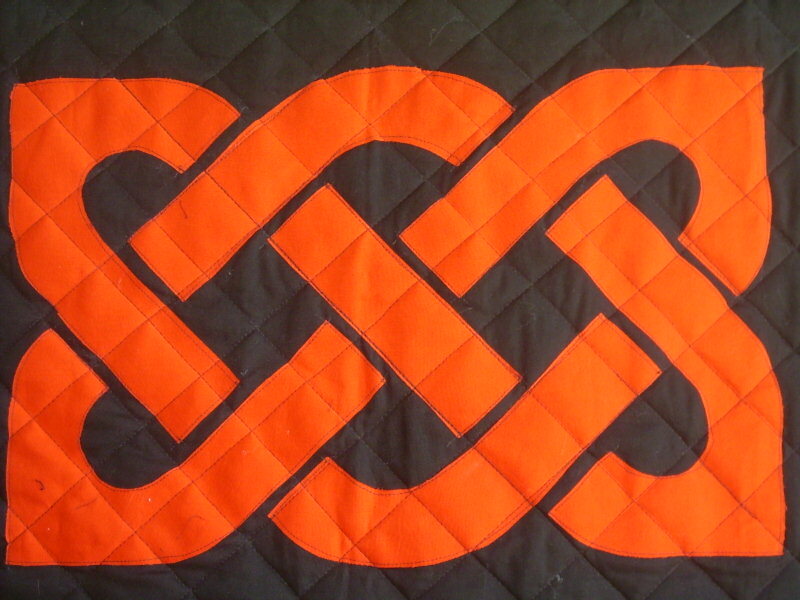 The pieces displayed here are large-scale Celtic knot appliques, a departure from the method usually used." 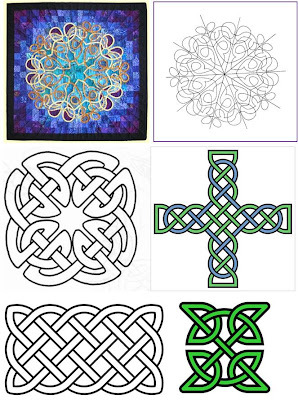 If you read about the history of Celtic knots, you will see this description: "Celtic knots are complete loops with no end or beginning." 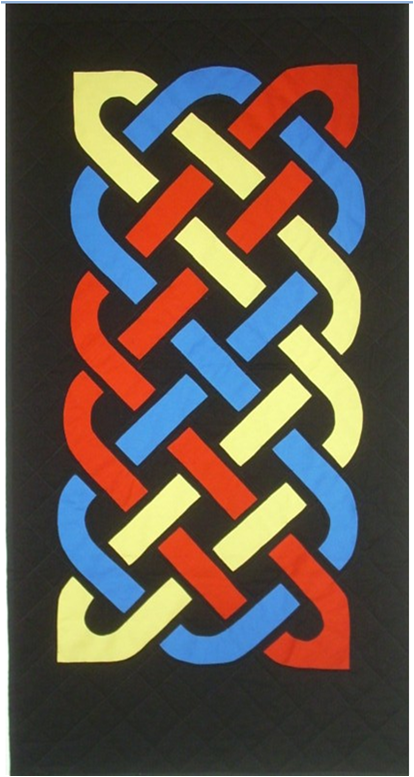 In quilting, Celtic knots are typically made with a continuous strip of bias tape. Raymond observed that such knots only look good at close range: "You can only appreciate the “woven-ness” of the knot when you’re close enough to see it, and though the knot may increase in size, the width of the bias tape remains the same, resulting in what looks like a spiderweb." In contrast, Raymond's large-scale Celtic knots can be seen from across the room, as shown in the exhibit photo below. What is intriguing is that your eye sees what looks like a continuous braid that goes over and under itself until it returns to the beginning. However, the knot is an illusion: the results appear woven, but they are not! 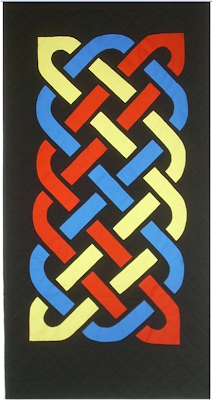 Individual straight, curved and corner pieces that are separated by gaps are used to depict the twists, turns, and weavings of the knot, as shown in the detail photo below. 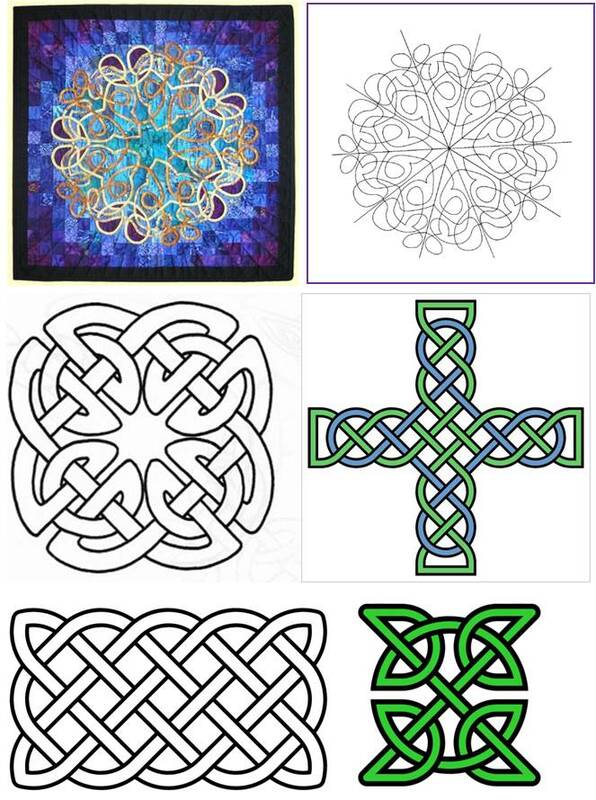 Sometimes Celtic knots are comprised of multiple strands. Raymond colors each strand differently to set it apart from the others and to highlight its relationship to the others. It is fascinating to observe how your eye follows the strands as if they were actually woven together, as in Knotted Band/II, below. 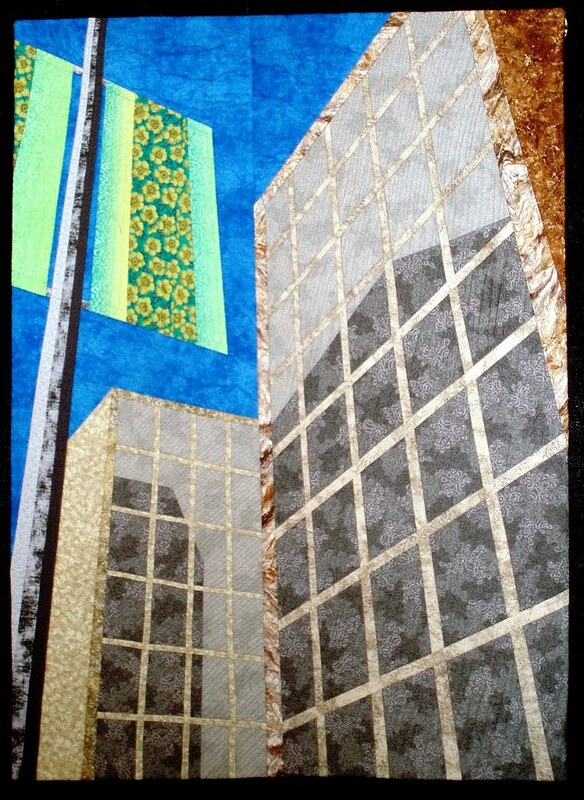 Raymond K. Houston's career has been distinguished by his innovative approaches to many different aspects of quilting. As he explains: "I'm beginning to think my quilting has gone through three different "periods" (who can forget Picasso's "Blue Period"?? 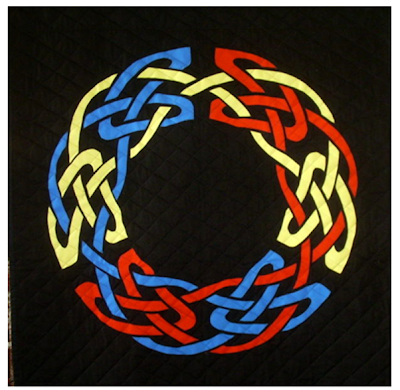 ): patchwork, tessellations, and now Celtic knots." At his Nacho Grandma's Quilts website you can read about his design inspirations, techniques and work-in-progress, and at Tessellation Nation you can read about the creation of a myriad of quilts based on a tile of his own design. Image credits: Images are shown with the generous permission of Raymond K. Houston. He gives lectures and design workshops to quilt guilds across the country and he has taught quilt design at the John C. Campbell Folk School in North Carolina and at Quilt University. He also has been featured at Simply Quilts on HGTV. The work shown here appeared in an exhibit called "Piece By Piece: Fiber or Glass" at The Gallery of By Design in Alton Illinois, in October, 2011. We are continuing with our series on fabulous, inspirational quilts from November 2011, when we visited the Houston International Quilt Festival. This week, we are featuring a "show within a show" from Houston: a traveling exhibit of outstanding Asian quilts from the International Quilt Week in Yokohama, Japan. 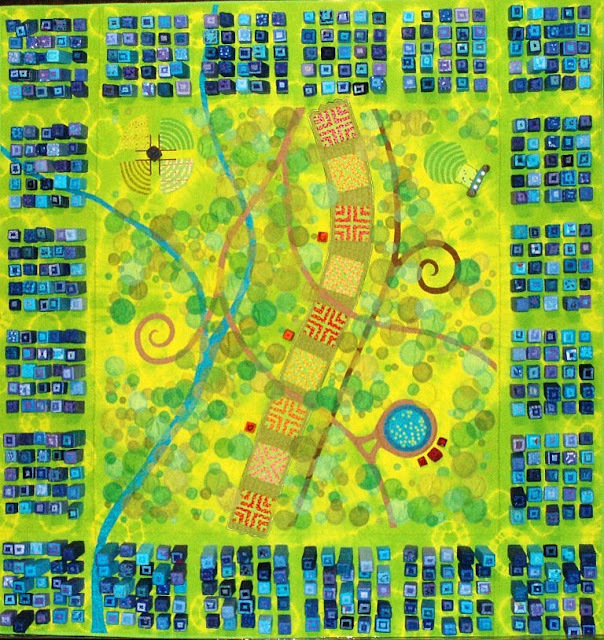 Hiromi's contemporary quilt is infused with color and movement. 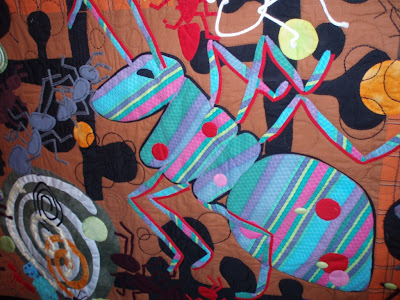 Notice how the ants are appliqued outside the background of the quilt, so they seem to be crawling off and on the quilt. Hiromi writes, "When I drew lines and curves freely, I thought I saw a large ant nest. It was the beginning of this quilt.....While making this design, I remembered we've not seen lines of ants for a long time, and it may be because of herbicide. I hope we retrieve the nature we lost." We like to imagine that this ant is the queen of the ant colony, as her lively blue and pink colors certainly allow her to stand out against the earth-toned background, silhouetted by the busy worker ants. ﻿Red and black trim around the ant's legs and body help to provide a great focal point for the quilt as well as a strong contrast. 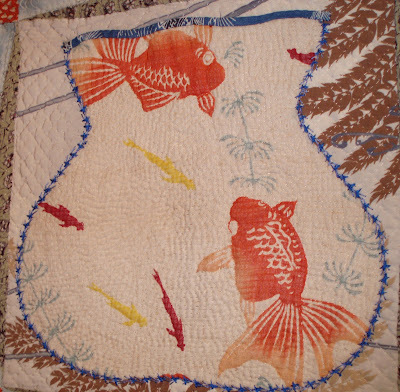 Kieko says of her pieced and appliqued block quilt, "I remember my happy childhood and used a child's kimono with goldfish for this quilt. 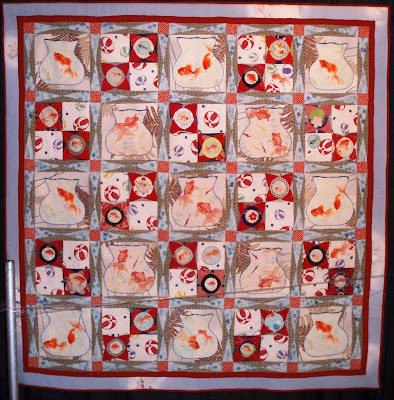 The rambling quilting lines depict the movement of water when goldfish swim." The soft chambray blues and the muted oranges of the silk goldfish make a restful yet interesting complementary color combination. You can see the superb applique work of Kieko's, as she carefully stitches the silk goldfish onto the quilt, then creates the goldfish bowl with a line blue embroidery. 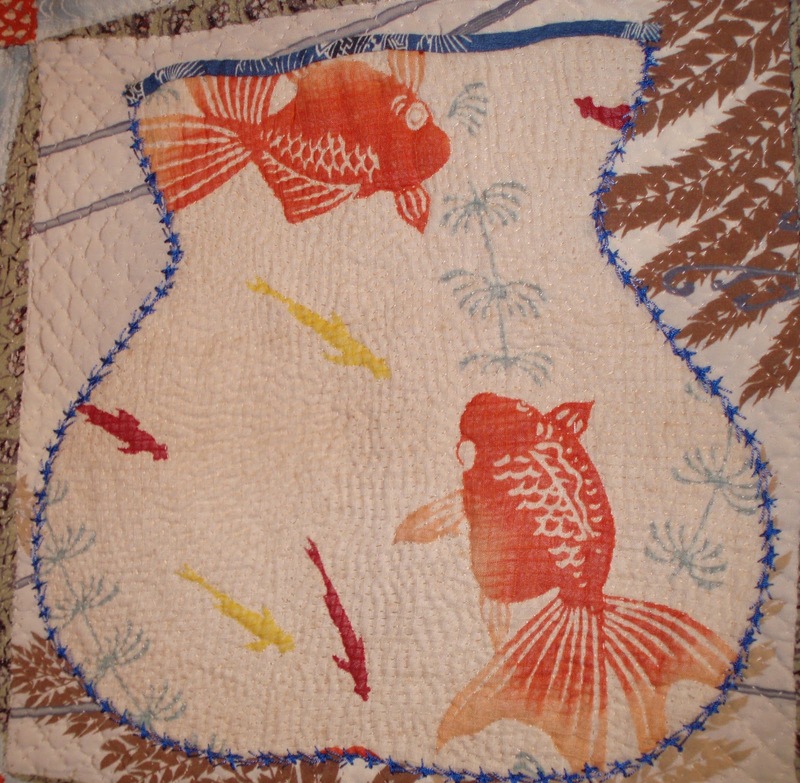 We have admired many Japanese quilts that very skillfully blended hand embroidery and applique together. Winner of the Grand Prix Award in Yokohama, Michiko Inaba explains that the gradated green background represents the shadings of different leaves plants in her yard. The white symbolizes the flower blossoms ad the garden gate, which Michiko has cleverly included as an applique in the quilt border. This exquisite quilt is created in a style very reminiscent of Hawaiian quilting, where an intricate pattern is carefully cut from folded fabric, then opened out full size (much like conjoined paper dolls) and ﻿appliqued onto the background. Here is the center of the quilt, a graceful star, which provides an excellent focal point. You an see the immense amount of applique work which went into this complex design of blossoms, leaves, and vines. In a quilt show like Houston's where every quilt is expertly designed and rendered, "My White Garden" stood out as a true masterpiece, even in the face of very talented competition. A group effort by Mikiko and her friends, this resplendent, abstract work depicts early dawn when purple shadows slice through the blue sky and morning clouds. Mikico writes, "We decided on daybreak as the theme and violet as the main color.We made this as a round robin quilt and tried to express each quilter's creativity." The smaller solid color blocks interspersed with larger blocks of many pieces create a beautiful transition between the peaceful night and the first light of day when all the earth's details come into clear focus. Sumie Nishimura writes that the design inspiration for this quilt came from a huge flowering 140 year old wisteria vine. She says, "I expressed the spectacular perfection of beauty I saw and felt while I stood under it." 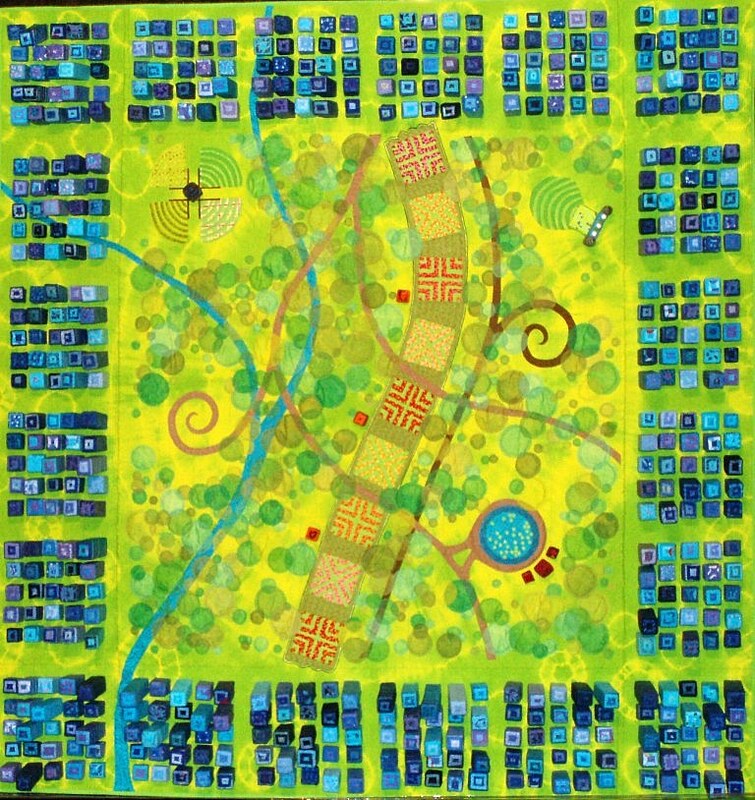 This quilt artist used an innovative technique by creating gorgeous contemporary panels to display the various forms of the vines, rather than portraying the plant in its entirety. Sushie's quilt won First Place for Machine Quilting. She chose threads with an analogous color scheme here to portray in hanging wisteria vines in luscious shades of raspberry, cranberry, and pale lavender. 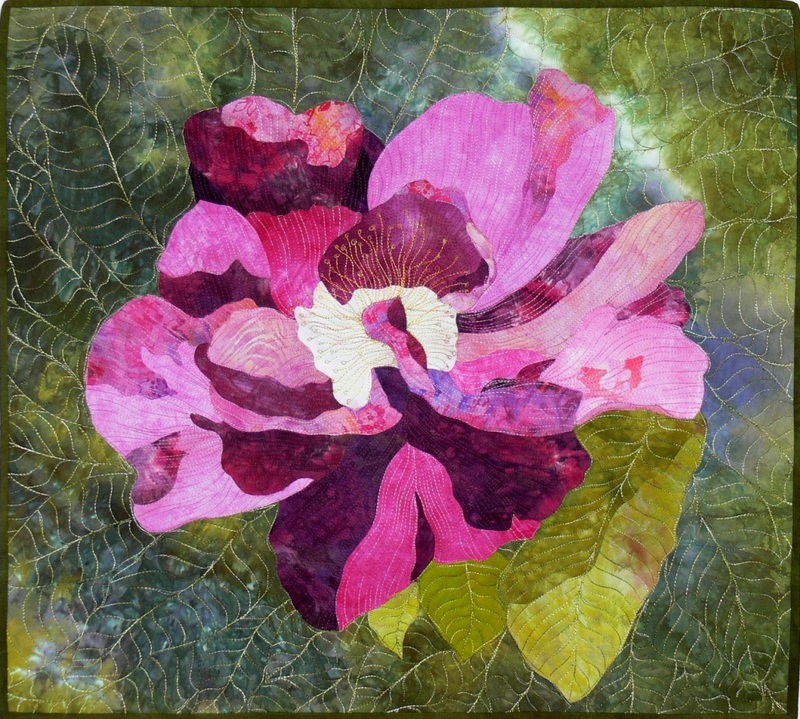 Elaine Quehl is an award-winning Canadian quilt artist, teacher, and dyer who specializes in intricately-stitched pieced and appliquéd art quilts. Elaine’s work has been juried into numerous exhibits at the national and international level and has been widely published, including 500 Art Quilts and Art Quilt Portfolio: Natural World (upcoming 2012). 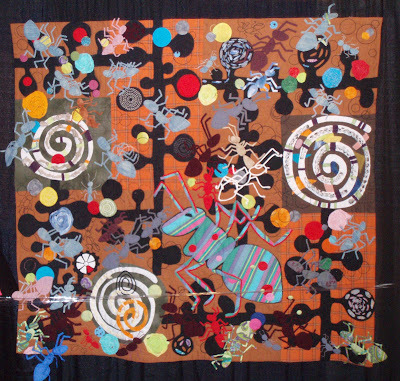 She says: "My quilts celebrate the visual drama that is present in the natural world and aim to evoke the emotion, awe and wonder I experience when I first encounter my subjects. Often described as bold and sensual, my work employs contrasts of light and shadow to intensify visual impact." Here are a few of her magnificent works of art. "Act 3" is just one of the sumptuous works in Elaine Quehl's Foliage Gallery. 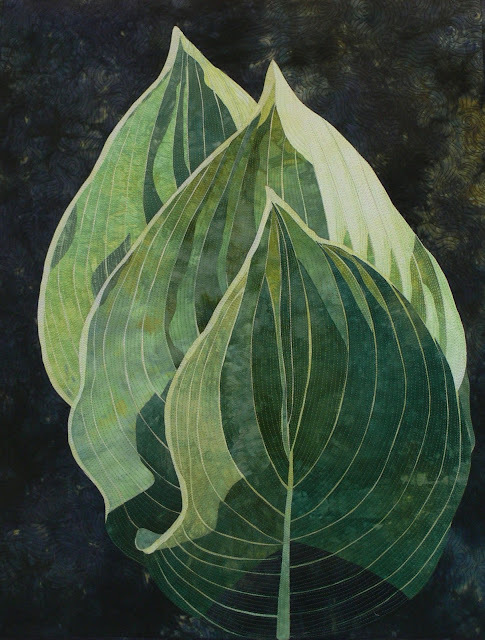 The soft texture of the leaves makes us want to reach out and touch them. Beyond its immediate visual impact, what makes this piece so intriguing is the nearly microscopic detail of the leaves themselves: the stem, veins, curved and furled edges, and the appearance of dappled sunlight and shadows. 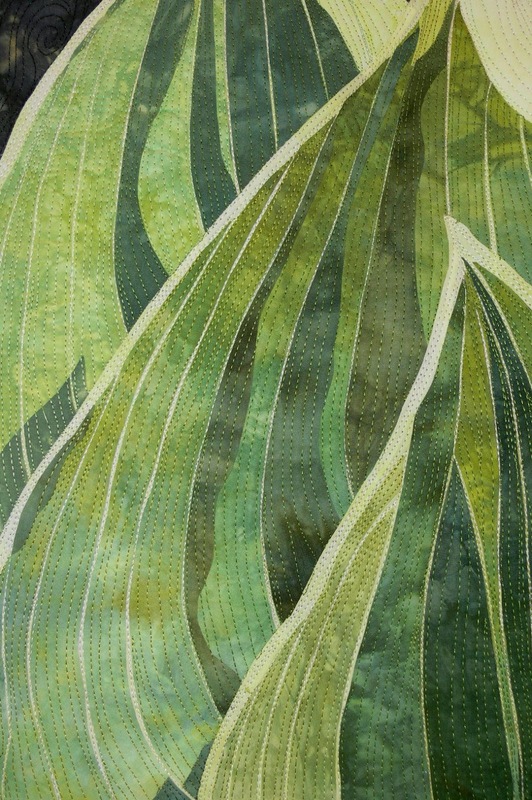 In the close-up photo below you can see the exquisite thread painting that accentuates the flowing lines of the leaves. To create "Smitten", above, Elaine used her own hand-dyed fabrics along with some commercial batiks; fusible applique, Prismacolour artist pencil, and free-motion machine quilting. We love the exuberant color and abundant texture of this piece! 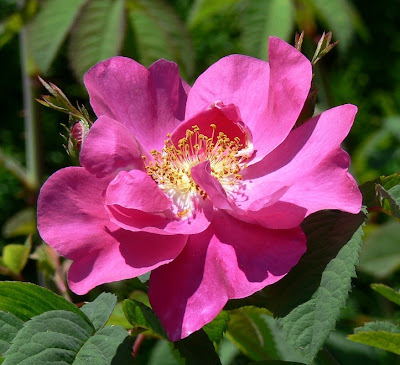 The work was inspired by a close-up photo of a wild rose which Elaine took at the University of British Columbia Botanical Gardens in 2006. It is fascinating to compare the art quilt with the original photo, shown below. 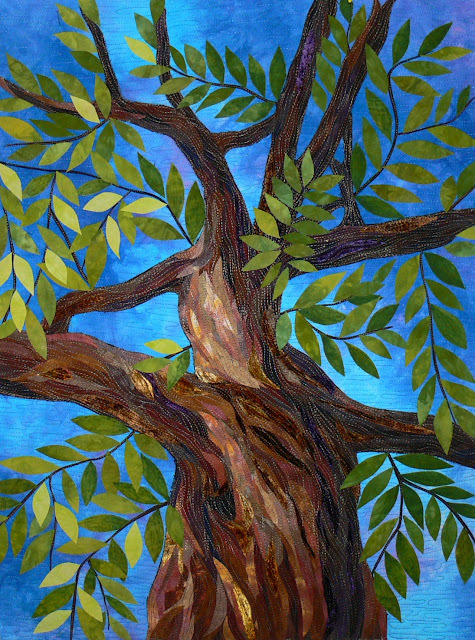 In "Branching out" Elaine Quehl has managed to capture the grandeur and imposing scale of the tree in a small space: the entire quilt is only 20 x 28". The perspective of looking up at the tree canopy, combined with the luminous background of the hand-dyed sky and the realistic texture of the bark, makes us feel as if we are in the scene. 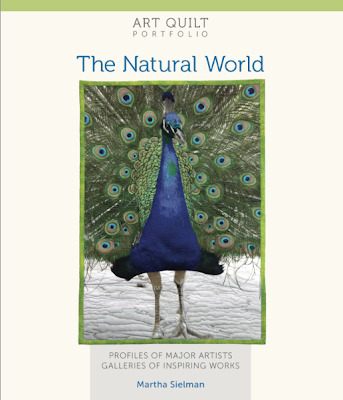 Last but not least, Elaine Quehl is one of the featured artists in the brand new book, Art Quilt Portfolio: the Natural World (published by Lark Books and edited by Martha Sielman; the cover is shown below). This lavish collection of art quilts, all focused on the natural world, includes nearly 90 amazing gallery images. It is due out on April 3, 2012 at Amazon.com.... we can hardly wait to get our hands on it. Image credits: Images are shown with the generous permission of Elaine Quehl. For more information and beautiful galleries of images, please visit Elaine Quehl's website. You can also read about upcoming events at Elaine Quehl's blog. The Kansas City Star’s gorgeous Block of the Month for 2012 honors the American heroine, Sacagawea, the only woman to travel with Lewis and Clark’s expedition. The young mother, who carried her infant son on her back throughout the arduous journey, was a symbol of peace to other Native Americans. Her contributions were many, her bravery and fearless heart outstanding. 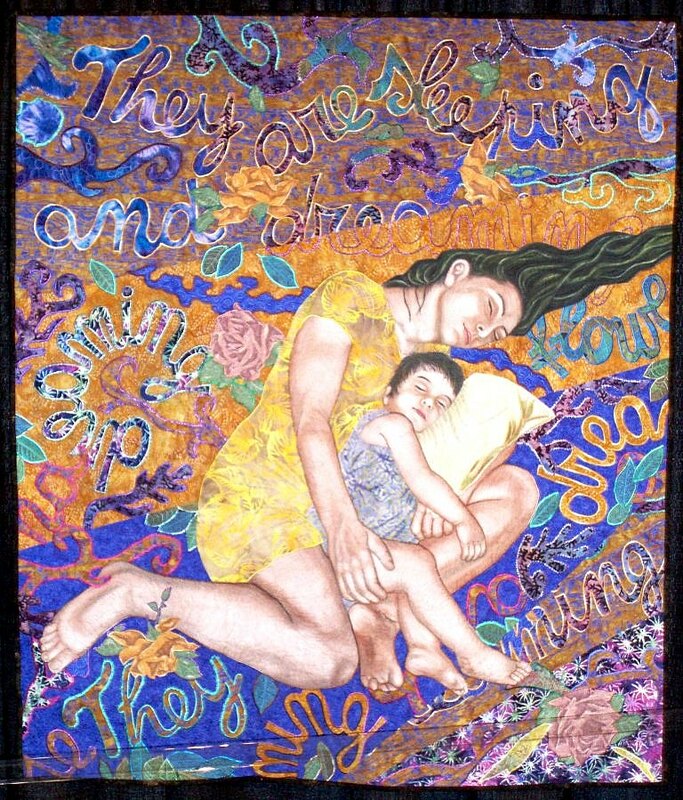 Laurie Simpson, of Simpson and Minick, designed, stitched and quilted this quilt that commemorates Sacagawea’s spirit and courage. 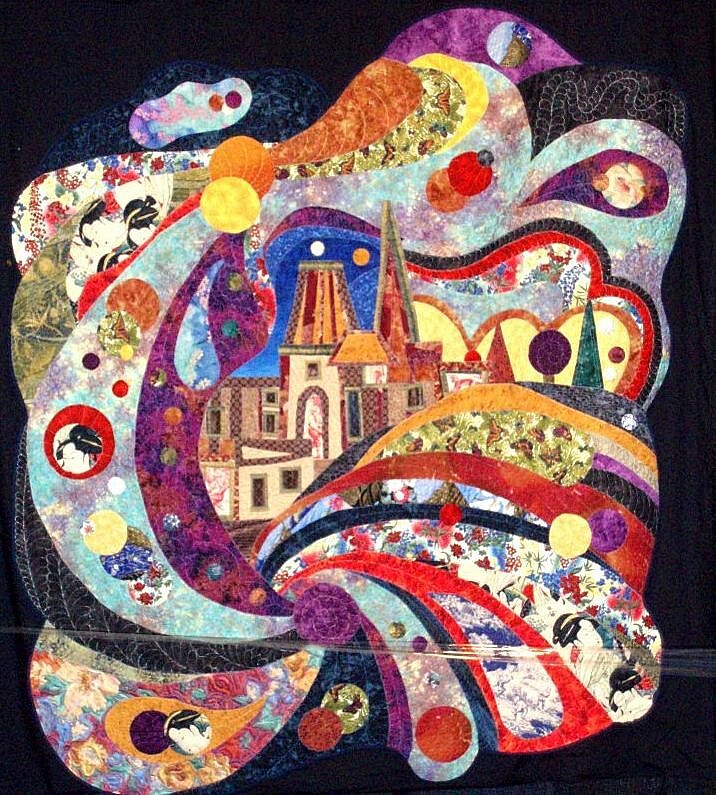 We're captivated by the folk art imagery in this quilt! This beautiful quilt was made from Laurie Simpson's scrap basket with all the red, white, and blue scraps of Minick and Simpson collections. 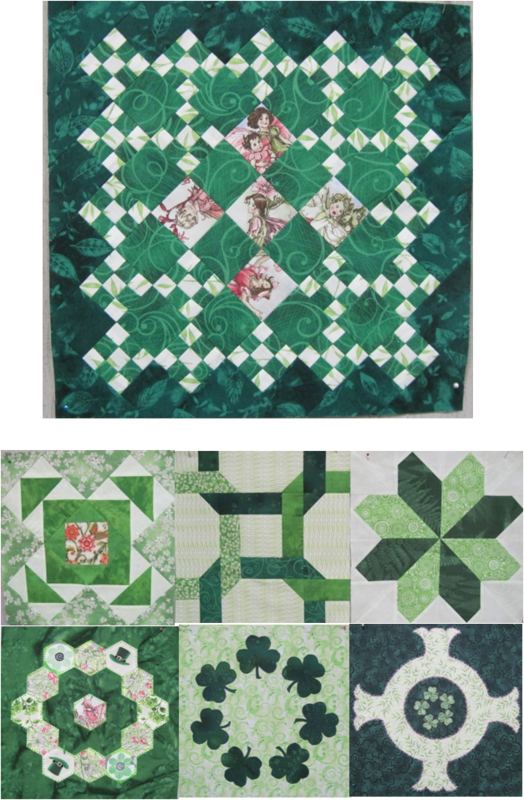 The quilt is a combination of pieced and applique work; six blocks are pieced and the rest are appliqued. 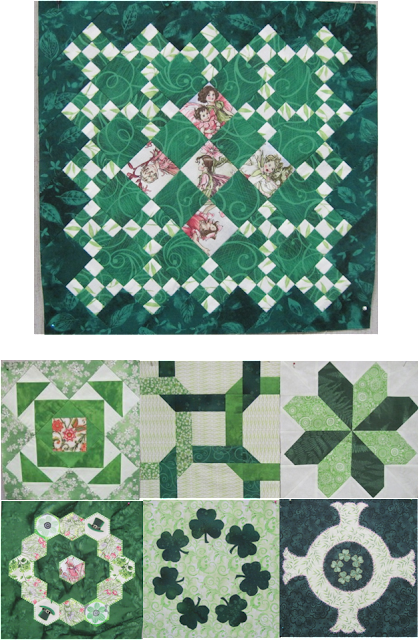 The block-of-the-month set includes all 12 patterns plus the finishing instructions. 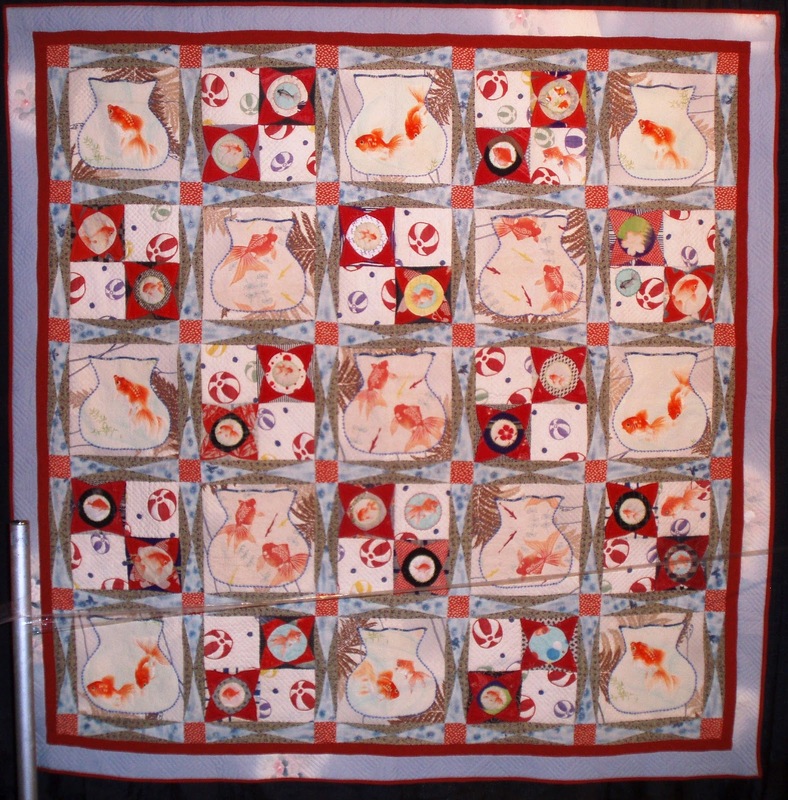 About Laurie Simpson: Laurie Simpson has delighted others with her quilts for over 30 years. 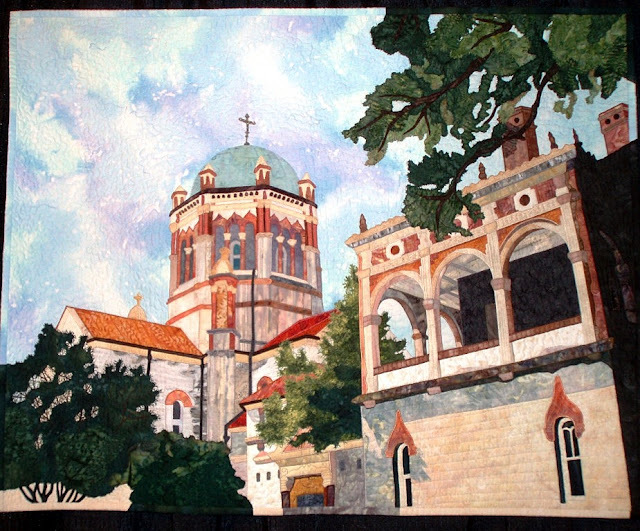 Drawn to traditional themes and techniques, she piece, appliques, and quilts by hand. Laurie is the co-author of "Folk Art Friends; Hooked Rugs and Coordinating Quilts" and "Everyday Folk Art; Hooked Rugs and Quilts to Make" with her sister Polly Minick. Laurie is also a Moda Fabric designer and will be included in the new book "Designer Quilts: Great Projects from Moda's Best Fabric Artists." Image credits: The image is shown with the generous permission of Laurie Simpson. For more information including patterns, kits and books please visit the Minick and Simpson website. Here are the winners of the February Giveaway ! We put all of your names into the hat, then Greg (the husband of Daryl) reached into the hat and drew out five names at random. Thank you all for your lovely comments! We are very grateful to have you as readers of Quilt Inspiration. Winners, please e-mail us your address within the next 7 days at quiltinspiration@gmail.com . We'll mail out your prize, postage paid. If you did not win, please be assured that we really appreciate your participation, and we will have another Giveaway coming up soon. The winner of Kaffe Fassett's "Passionate Patchwork" book is Monica from "Diary of A Quilt Maven". The winner of the $10.00 Jo-Ann gift card is Lisa Marie, who wrote "Thank you for offering this great giveaway and for all the free patterns on your sidebar." The winner of the Modern Robe pattern is Lisa, who wrote on the Modern Robe blog, "This one is particularly gorgeous." The winner of the Hoffman batik fabric is Sheila from Canada. The winner of Jeana Kimball's Red and Green book is Mimi from Canada. Thanks very much again everybody, and please stay tuned for the next Giveaway !